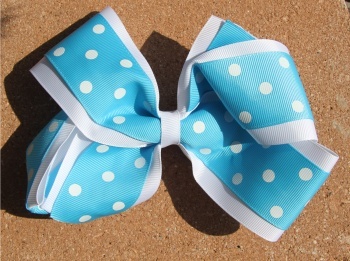 Polka Dots and Turquoise, what a great combination! This is a double layered grosgrain bow that is wrapped together with a white 3/8" ribbon and attached to a French clip. The white polka dots radiate out against the turquoise blue and then on the white background. Polka dot lovers have to get this bow.